A new piece of public art in West Hollywood is coming out swinging. 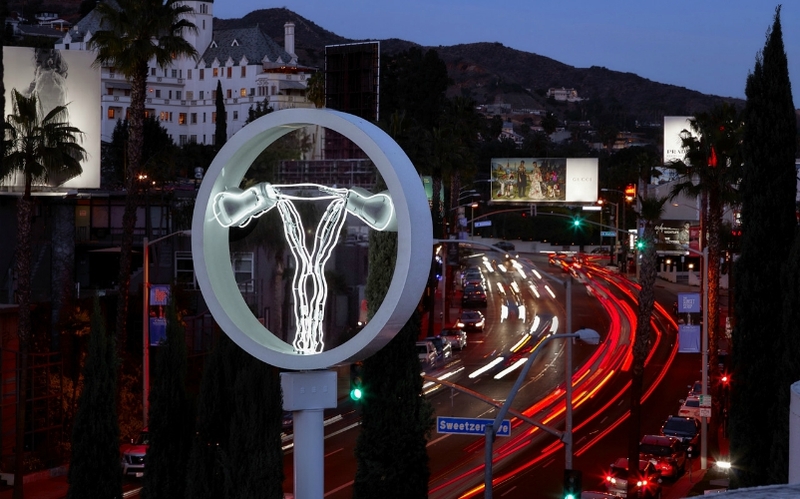 Artist Zoë Buckman’s work Champ depicts a neon uterus with oversized fiberglass boxing gloves in place of ovaries. The symbol of female empowerment will be unveiled Tuesday, February 27—just in time for the start of Women’s History Month—after which it will remain on the corner of Sunset and Sweetzer for one year. She responded to those threats by incorporating her personal activism into her art. “I was taking metal gynecological instruments and powder-coating them in my studio, and turning these cold, harsh, metal, almost torture-device-looking pieces into something more beautiful,” she explains. One such piece, Rainbow Speculums, was on display at the Into Action exhibit in DTLA last month. Champ will be lit for the first time on Tuesday, February 27. On March 3, a solo show of Zoë Buckman’s work, entitled “Let Her Rave,” will open at the Gavlak Gallery, 1034 North Highland Ave. That exhibit will run through April 7.